(autoinsidernews) - Ford announced today that the first 2007 Ford Edge and Lincoln MKX crossover began rolling off the line at Ford of Canada's Oakville Assembly Complex. The launch of production of the Edge and MKX marked the automaker's completion of a $1-billion conversion to flexible manufacturing. The people of Oakville Assembly are creating our future. 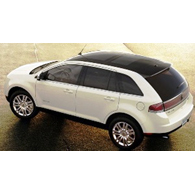 Products like the Ford Edge and Lincoln MKX create the value and excitement that customers want. Not only are the products fantastic, but the flexible manufacturing processes we see in Oakville will help us deliver new products faster than ever and with outstanding quality, said Alan Mulally, president and CEO, Ford Motor Company. Oakville Assembly will also build a full-size, seven-passenger people mover based on the Ford Fairlane concept, which is slated to go on sale in 2008. Ford Edge and Lincoln MKX go on sale in November.